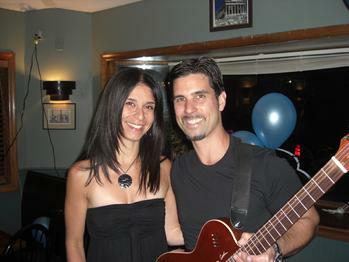 Mike and Miriam Risko are the owners of the Mike Risko Music located in Ossining New York. In addition to being music teachers and business owners, the Riskos are well known locally for their musical entertainment. They have been playing music in the tri-state area since the early 90's. Mike has played guitar in bands like Mr. X, Toast, and Opium for the Masses while Miriam (formerly known as Miriam Baily before she and Mike got married in 2000) was the singer for bands like Said and Done, No Pressure and Yazmin. Together in 1997 they formed the band Lucy's Frantic and performed all over including South Street Seaport for New Year's Eve 1997 and 1998 and Fourth of July for a Z-100 sponsored event in 1998. They donate their time regularly to perform for different organizations. Rock2Rebuild-Musicians for Tsunami Relief and area education foundations like Briarcliff Manor, Croton on Hudson, Pocantico Hills and Ossining are some of the many groups they have worked with. In addition they have worked closely with the Briarcliff Manor Chamber of Commerce on their yearly Harvest Festival and First Thursday Monthly Events and the Ossining Chamber of Commerce on the Ossining Village Fair. They also have provided music for the Croton Village Fair through Croton Recreation, The Chappaqua Summer Concert Series and The Ossining Summer Concert Series. They have volunteered their music for many other local events in Ossining and surrounding areas including the Star Spangled Banner for Opening Day for Ossining Baseball and the Ossining Inaugural Ceremonies and the PTA sponsored Magic Masters Basketball game. They have performed at the Atria in Briarcliff Manor, The Westchester Mall, Ossining Earth Day, The Briarcliff Manor Rotary Club, and the Christmas Tree Lightings for Ossining and Chappaqua in addition to events for the Chappaqua Chamber. They have partnered with Ossining Little League Football to provide students to sing the National Anthem at the fall football games. Some of their other performance venues including local clubs have been Trump Golf Course, Sleepy Hollow Country Club, Captain Lawrence Brewing Company,Maya Riviera, 105-10 The Hudson Room and many more. The Riskos have provided music programs in the Ossining and Chappaqua Schools in addition to CSI Nursery School and Garden House Nursery School located in Briarcliff Manor. They also do a free "Meet the Strings" Program during which they introduce nursery school aged kids to all kinds of instruments with strings. They also run the Pre-K Piano Program at the Ossining Children’s Center and they provide the music program to the Pleasantville Cottage School and Edenwald School. Collectively they have performed at thousands of shows. In addition Mike has done various recordings and released a CD in 1997 with the band Opium for the Masses while Miriam has performed in many musicals like Godspell, The Pajama Game, They're Playing Our Song & she directed A Funny Thing Happened on the Way to the Forum with the Saw Mill Summer Theatre in Chappaqua. She also sang on the soundtrack to the movie Contact Blow. 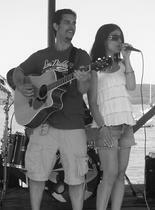 Today, known as Mike and Miriam, they perform regularly as a 2 piece acoustic duo. They also have a 4 and 5 piece electric band called The Mike Risko Band that performs at larger events. Their band released a Holiday CD in 2011 called “I’ll Be Home For Christmas”. They founded their music school in 1995 and in 2009 bought a building and moved the music school down the street to their new location where they also opened a music store carrying musical equipment like Godin,D'Angelico, PRS, Ibanez, Tama and Audix. They have a band rental program and rent instruments to all the local school districts, repair musical instruments and carry sheet music. They have over 600 students going through their music school each week and they offer lessons on all instrument and voice in a wide range of styles. They have over 30 teachers on staff teaching their curriculum and they offer monthly recitals, open mic nights and adult rock band classes. They have been offering Mike Risko Rock Band Camp each summer since 2000. Mike is endorsed by Brian Moore Guitars and Godin Guitars. He has written three books, The Mike Risko Guitar Method Book 1, 2, and 3. Miriam is a member of the National Association of Teachers of Singing, is a licensed Kindermusik Instructor and is listed on the website rockinmoms.com. She also has been featured in Audix Mic advertisement. The Riskos have been featured in Consumer Reports Magazine for their business skills and were also featured in a news clip which was broadcast on 80 ABC stations across the United States in which they were interviewed and played a song. Mike is a regular speaker at the National Assoiciation of Music Merchants trade shows in both Anaheim California and Nashville where he speaks to peers who own music schools and stores all over the world about creative ways to improve their business. The Riskos write regulary for NAMM U on line which is the Trade Association website for their industry. Their articles have also been featured in Westchester Family Magazine. Mike and Miriam Risko are community oriented people with two children and believe in being a part of the community that has supported their business and musical ventures. Miriam has been serving on the Executive Board of the Ossining PTA since 2010 and currently is the Vice President of the Ossining Upper Elementary PTA. She was also on the board of the Ossining Downtown Entertainment Committee in 2013 and 2014. Mike is on the executive board of the Greater Ossining Chamber of Commerce and the board of the Ossining Arts Project. Their business won the Best of Westchester award in 2010, 2014, 2015 and 2016 (Best Music Store, Best Music School, Best Unique Birthday Parties). They were also named a top 100 Musical Instrument retailer in the world by the National Assoiciation of Music Merchants in 2014, 2015 and 2016 and were recognized as a top three in the Music Makes A Difference Category for their work with various non-profits in 2015 and Customer Service in 2016. In 2015 and 2016 they also received recogntion from Westchester Family Magazine as a top place for music lessons and Best Rock Music Program in Westchester and they were named by News 12 Westchester as a "Gem of the Hudson Valley" in the Where are We on Wednesday Series in August of 2015. They were thrilled to be recognized by 914 Inc Magazine for general business excellence in the 2015 Third Quarter Issue and recognized at an awards ceremony in September of 2015. In 2017 they received the Westchester Business Journal Award for Family Owned Business, Macaroni Kids Gold Daisy Award for Best Music Lessons in the Rivertowns and Best Clinics in the country from Sound and Retailer Magazine. Open Mic Night March 2005. At the Rockin Horse Steakhouse. 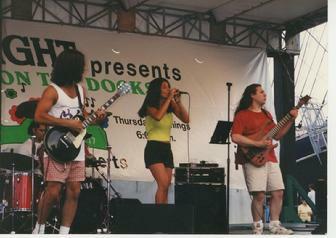 Mike and Miriam with the band Lucy's Frantic in 1997 at South Street Seaport in NYC. Mike and Miriam at the Crown Plaza in May 2008.